Recently, Lorry and I took a month to drive out to the west coast (Washington State) and then return through “Mid-America”. 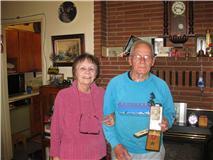 During the trip it was our pleasure to visit Gerrie & Chuck Caruth. Gerrie’s a Schoenly Family member, her mother was Mary Alice Schoenly. Gerrie and I have corresponded for several years via e-mail. Initially, I believe Gerrie found the SCHOENLY.COM webpage and got my e-mail address there. It was a real treat to meet her & Chuck face to face after all this time. Gerrie and I share a set of common GGGrandparents, Jacob B. Schoenly & Maria Latshaw. I think that makes us third cousins. Over all, that’s pretty closely related. Most of the Schoenly connections I’ve made thus far are fourth cousins -or- 4th cousins, once removed. I have been trying to not post information regarding living persons but I’m excited to have been given the chance to meet Gerrie & Chuck and they have given me permission to make this post.